Dr. Sciascia Presents His Second Masters Class of the Year...In India! 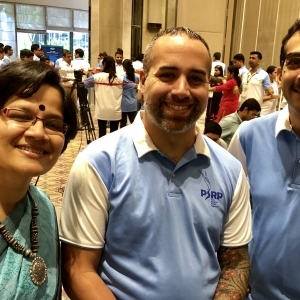 On August 3, 2018, EKU Athletic Training faculty, Aaron Sciascia, delivered a 1-day Scapula Masterclass to approximately 110 physiotherapists in Pune, India. Dr. Sciascia was invited to deliver this course by Ashish Babhulkar, MD, an orthopedic surgeon in Pune who specializes in the shoulder. “I was honored to be invited to India to deliver this course and the hospitality and welcome I received from Dr Babhulkar, his staff, and the course attendees was remarkable!